Join Captain Toby aboard the T-Time for your next Outer Banks charter fishing trip! Captain Toby Russ has lived on the Outer Banks since 1995 when he graduated from East Carolina University. He has fished every season out of Pirate's Cove for the past 12 years and has 19 years of fishing experience. The T-Time is a 21-foot Carolina-built center console outboard designed to fish the inshore and nearshore safely and comfortably. The boat is equipped with GPS, fish finder, VHF radio and a 32 gallon livewell. We offer quarter, half and full day inshore or nearshore trips, as well as two hour crabbing trips and one and a half hour sightseeing sunset cruises out of Pirate's Cove Marina in Manteo, NC. 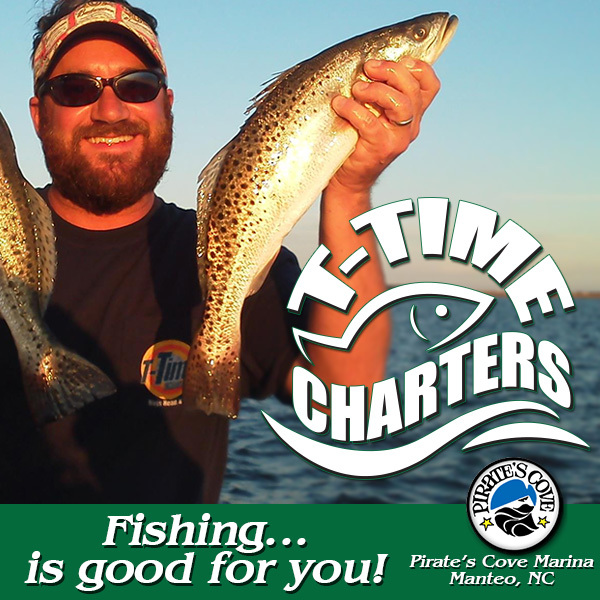 T-Time Charters targets the outstanding variety of game fish that the rich waters of North Carolina provides for anglers. We try to match the tackle to the species we're chasing to provide a thrilling fight. T-Time welcomes 1-4 anglers of all ages and skill levels and provides all bait, tackle, and ice for your trip. You will want to bring any food and beverages, sunscreen, rain gear, and a desire to catch the big one! Ready to catch Cobia, Sharks, Amberjack, Spanish Mackerel, Speckled Trout, Redfish, Striped Bass, Flounder or Blue Fish? Book your trip with T-Time Charters today!